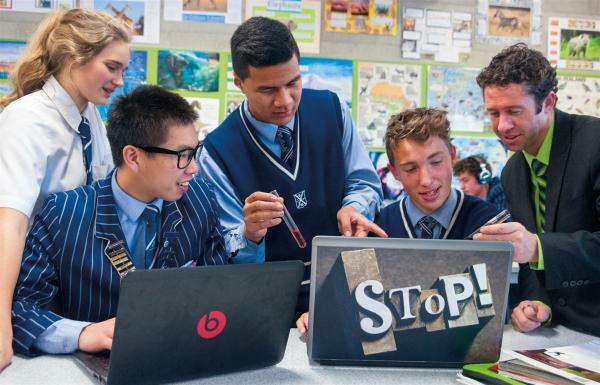 CORE Education is well known in New Zealand for delivering major educational events such as ULearn, Learning@School Roadshow and the Emerging Leaders Summit. 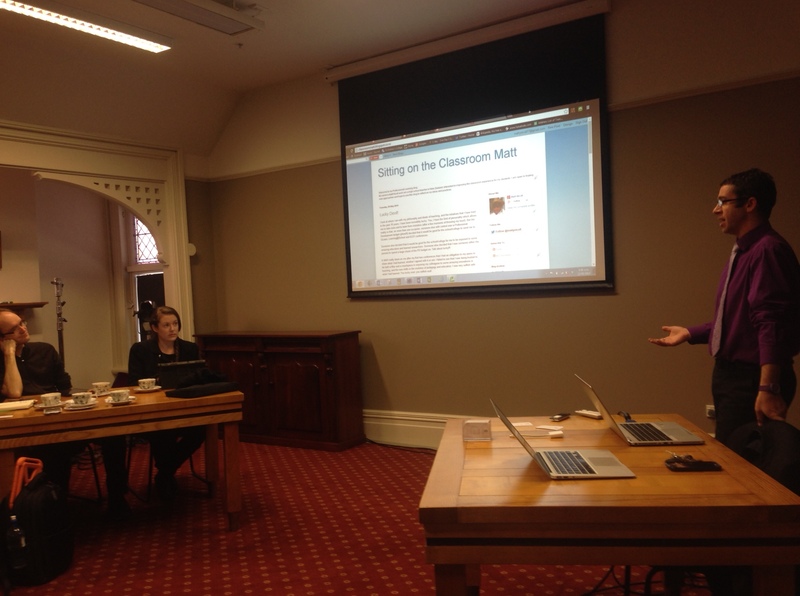 Earlier this month I was asked by Margot McKeegan and John Fenaughty if they could bring their 2014 eFellows to St Andrew’s College to learn more about eLearning in our classrooms. 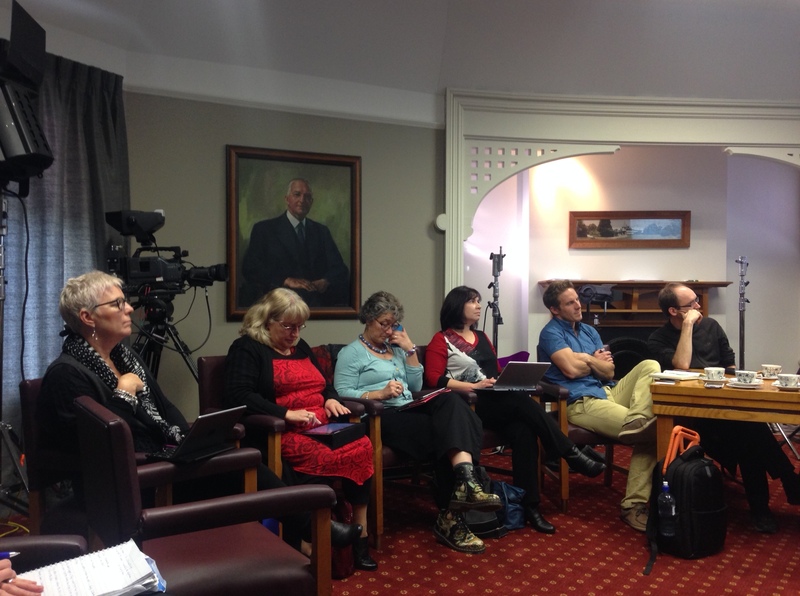 This struck me as a good opportunity for some of our teachers to meet the eFellows, teachers from around New Zealand recognised for their commitment to eLearning and the successful implementation of it in their classrooms. Additionally, it was a perfect chance for the great work our teachers are doing to be shared with a wider audience, with hopefully some of the connections made today growing with shared professional development over the coming months. 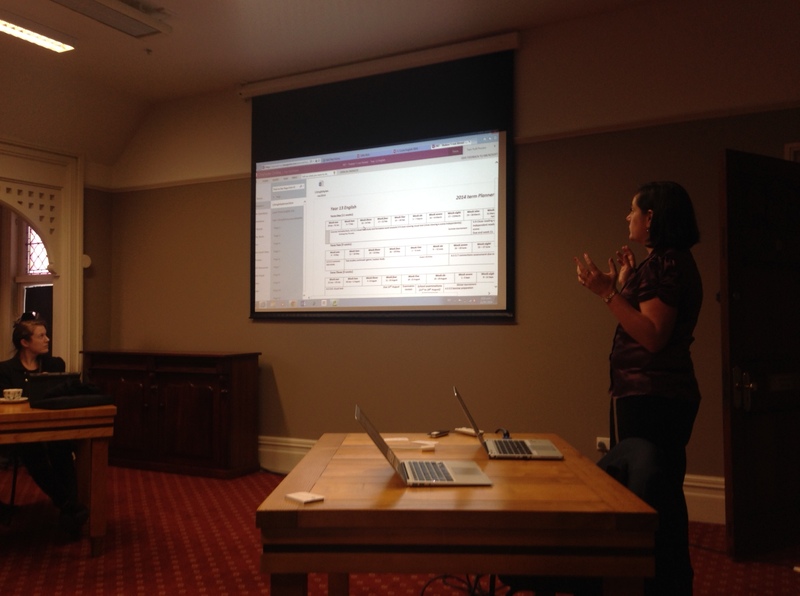 Dr Jeni Curtis talked about use of OneNote and Moodle, particularly with her Yr9 BYOD class. This blog post would give a good summary of her discussion today. Mrs Nicola Richards talked about integrating the SOLO Thinking Taxonomy into her PE and Health teaching, along with her aim to have a “paperless” class with her Yr9 students. This blog post would give a good overview of her chat today. Mr Matt Nicoll chatted about his personal reflective blog, approach to his classroom blogs with his students and also some of the practicalities of recording his teaching moments. This blog post is worth reading if you’re interested in this and he was also interviewed for NZ Science Teacher on this subject too. Ms Tam Yuill Proctor talked about how technology has impacted on her teaching, particularly with the Yr9 Cohort 1:1 programme, along with some of the MLE furniture she is trialling in her classroom. 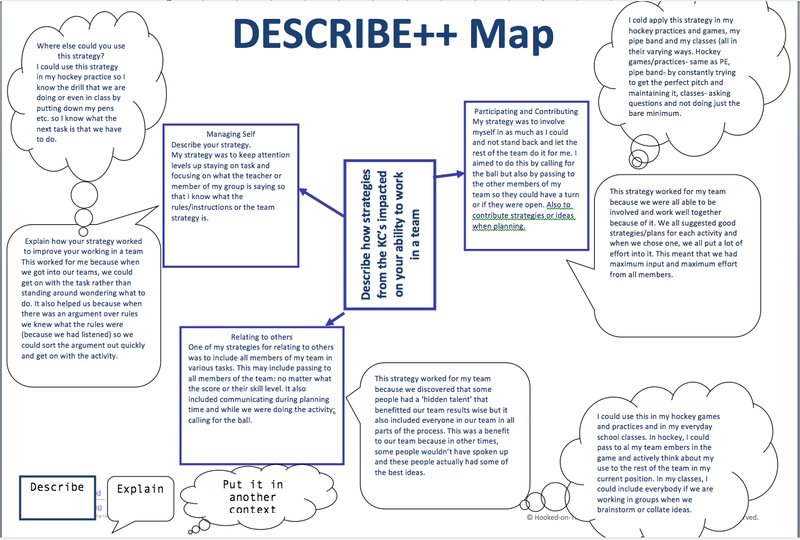 This blog post shows some of the innovative use of technology she has used in a Level 3 English “Digital Narratives” assessment. Ms Rachael Hoddinott gave an interesting perspective from the Preparatory School, calling herself a “self taught dabbler” in eLearning! She demonstrated her regular use of Moodle, Socrative, LiveBinders, and OneDrive as part of the Office365 suite. 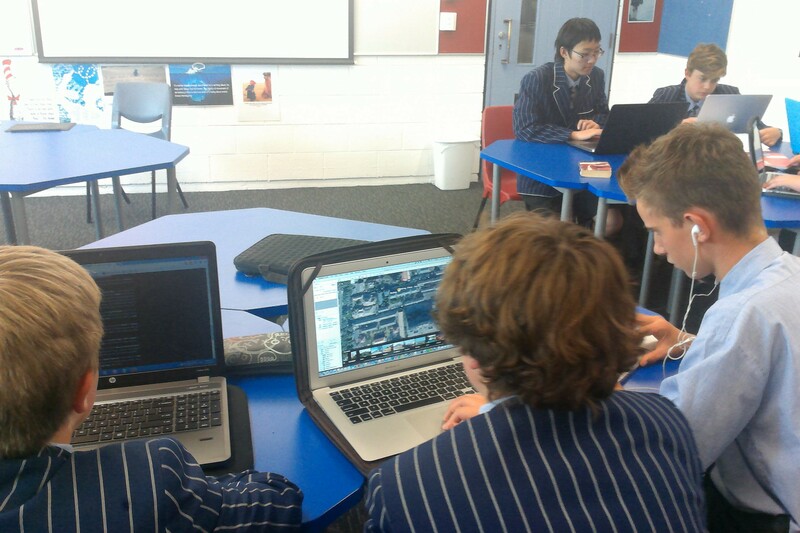 Teaching extension maths to Yr7 students, she is also in charge of the GATE group involved in the Future Problem Solvers competition, and she explained how technology facilitated the sharing of resources even when students didn’t always meet regularly. It is great to be able to facilitate the sharing of knowledge amongst progressive teachers like this and hopefully there will be more opportunities like this in the future! I was invited to speak today with staff from Catholic Cathedral College who were part of a Professional Learning Group (PLG) that is focusing on the impact of technology in the area of literacy. With the introduction of BYOD in Yr9 at St Andrew’s College, I felt it was a good chance to extend the ideas I had around the use of Moodle for assessment and also how we could introduce OneNote as our “workbooks” in PE. It was also a good chance to see how we could formalize the SOLO taxonomy used in classes. Here is a summary of how we have used both technologies. OneNote has been used as our “day to day’ workbook in PE. We had a few teething issues to start in terms of getting students set up. Each student now has a notebook that they have shared with their teacher and for the PE “section” they have the course outline and a “page” for each unit. 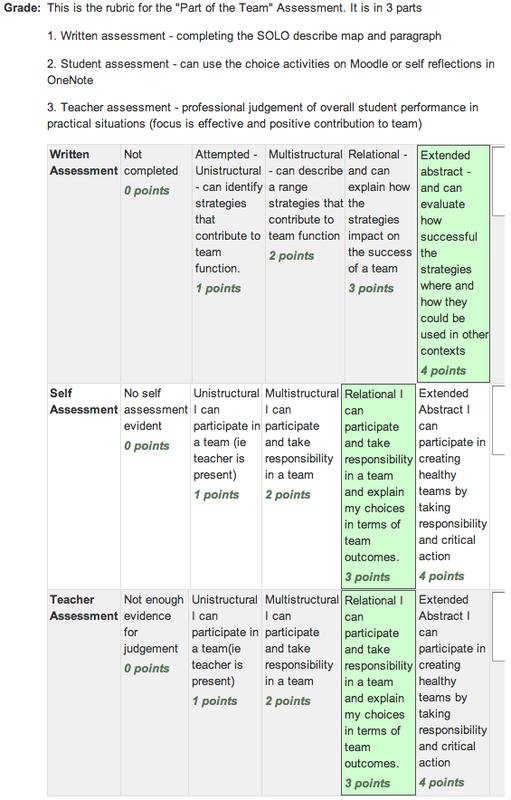 For the first unit “Part of the Team” there is a SOLO rubric that the students reflected on their performance (generally out of class). The benefits of this were that we didn’t have bits of paper floating around the gym that seem to get “lost” and I could see what students had and hadn’t done and provide brief feedback. Below is an example of a student’s Notebook. I have designated Moodle for formative and summative assessment for the main part – although I did end up using it for resources as well, when my initial OneNote plan fell through. 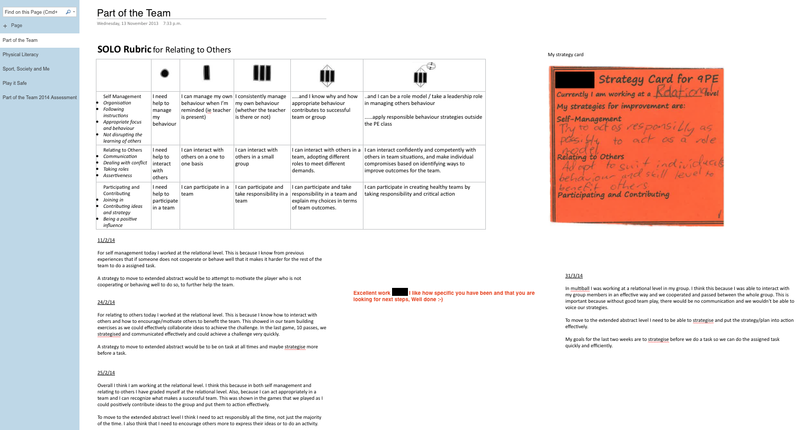 Students used a “Choice activity” for their initial and final self assessments (based on SOLO taxonomy) and also submitted their final written assessments (a SOLO Describe++ map and paragraph) to Moodle. 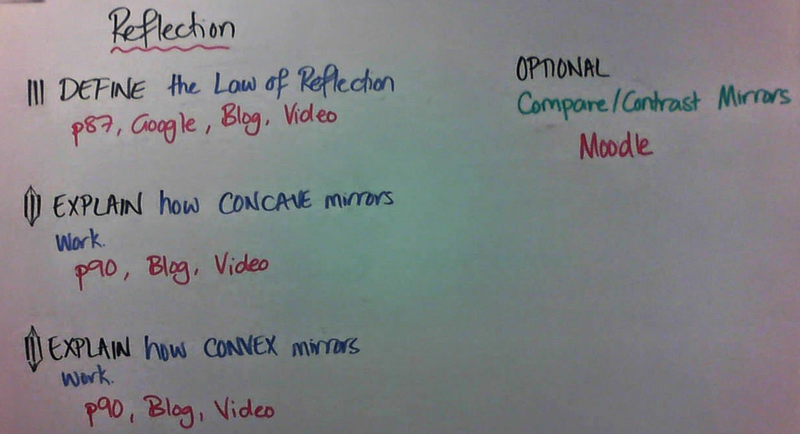 With the “Choice” activities I could very quickly see where students thought they were at at the beginning of the unit. 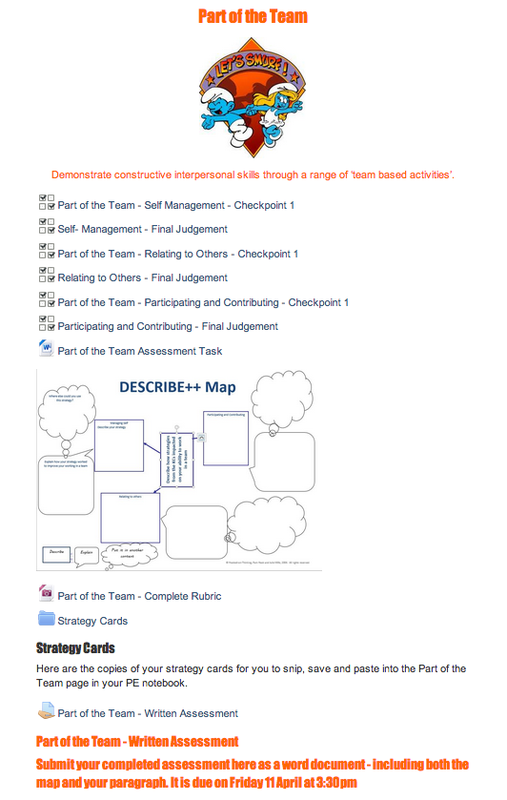 It also helped with the overall assessment at the end of the unit. 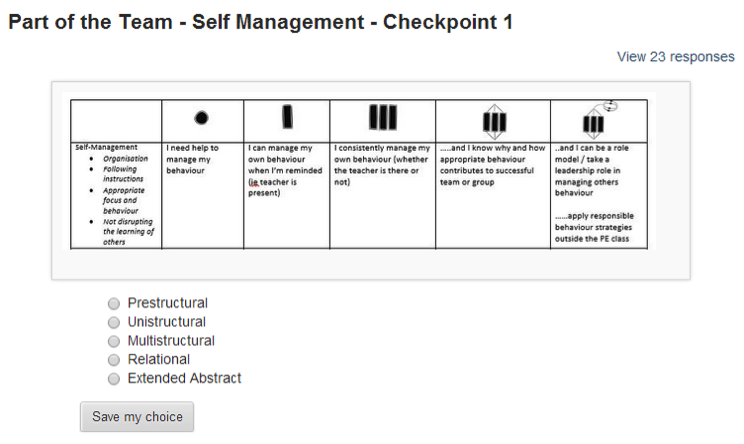 I used SOLO taxonomy to create the final assessment rubric on Moodle and meant for quick and easy marking with the ability to also include more specific feedback if required. At report time it is very easy to go into the gradebook and see the results for each of the units. 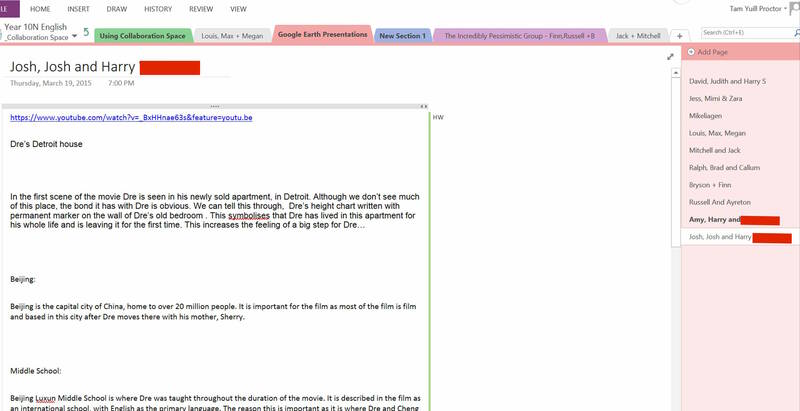 It doesn’t solve the problem of non-completion but it is much easier to see who has done what and follow up via emails. Overall I have enjoyed the challenge of introducing BYOD to PE and I am looking forward to how we can use it more for practical activities particularly in our next unit “Physical Literacy”. 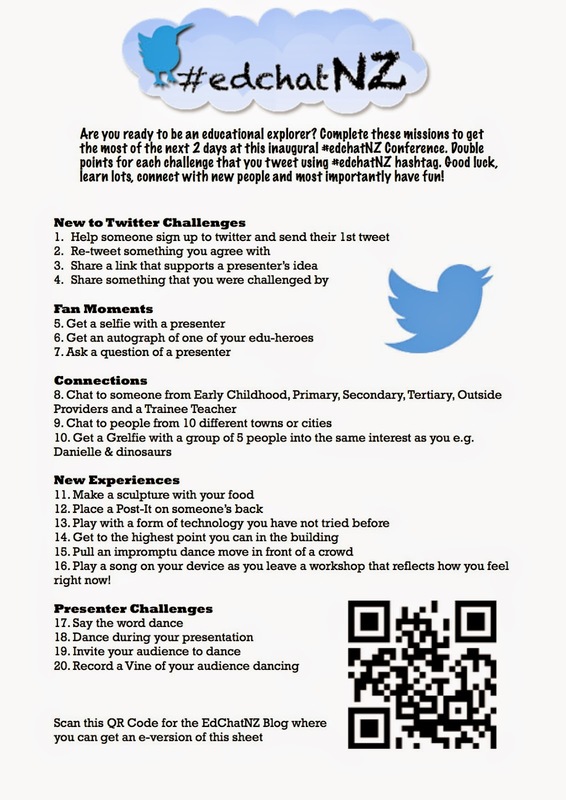 My goal to have a “paperless” Yr 9 PE course is still intact! 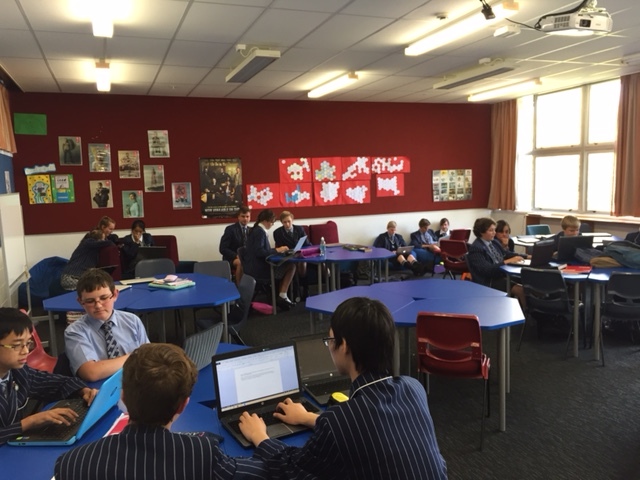 Today’s blog post will explore how science teacher Mr Matt Nicoll has implemented class blogs to record key learning moments that his students can refer back to at anytime. If students knew they had full access to correct and accurate notes, they would spend less time copying, more time listening to crucial explanations and demonstrations, which would lead into greater focus and accuracy when they conducted their own experiments.